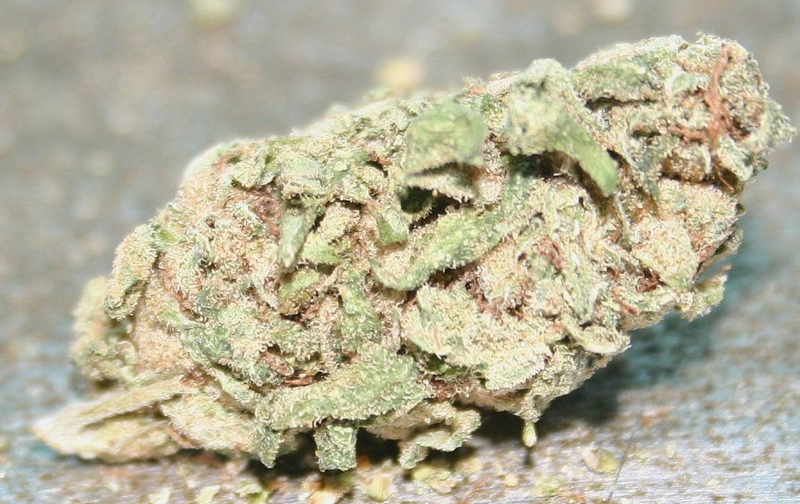 White Widow is another hybrid strain with a sativa dominance. A reason for its popularity besides its ability to energize you, is its spectacular production of resin. 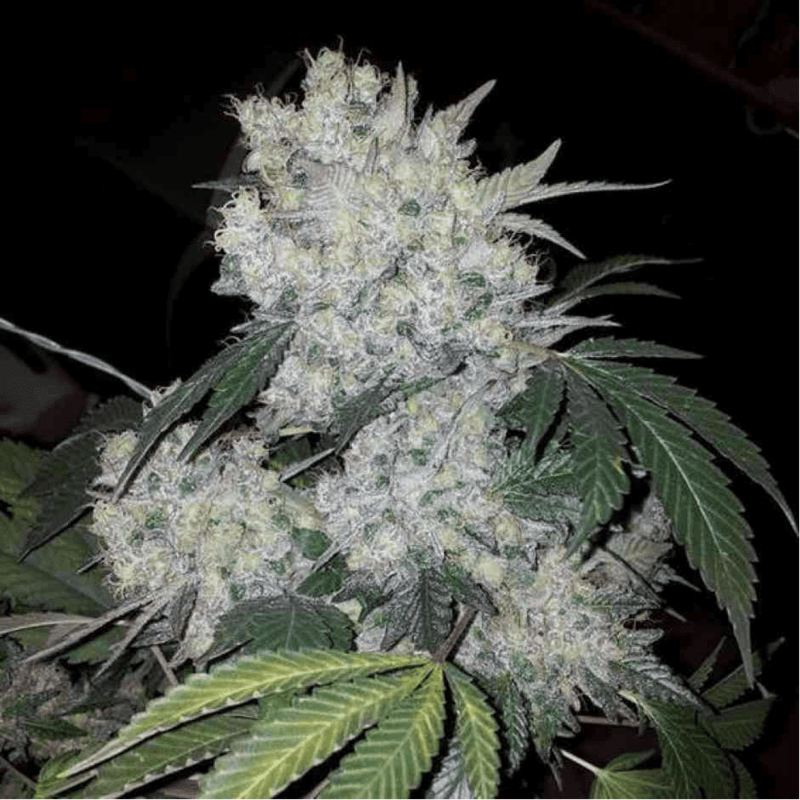 The strain was produced by Green House Seeds, a group of Dutch veterans by crossing the South Indian sativa and Brazilian indica landraces in 1990s. White Widow was bred particularly keeping in mind a high trichome count. Because of this it is highly prized when it comes to producing hash.White Widow's genetics have given rise to many other legends like White Russian, White Rhino, and Blue Widow. Still, many growers prefer cultivation of the original White Widow, which flowers in about 60 days indoors. The White Widow has a notoriously high THC average at 20 percent. There are some phenotypes of this strain where the THC content exceeds this amount too. Because of this it has even won multiple awards including the 1995 High Times Cannabis Cup. The White widow's buds are unusual in terms of shape. They are conical and chunky. Instead of being dense, they are tapered. Additionally, the buds have a fluffy and loose texture which means they can be broken easily even though they are rather sticky. The leaves, on the other hand, are spring green in color and have some pistils amongst them. When they are fully grown, the buds are covered by white trichomes with long stalks. White Widow has a sharp smell similar to that of ammonia but is accentuated with a pine-like, earthy smell. Upon breaking, the buds emit a smell similar to hash and incense. This pungent odor remains even after combustion. The smoke, meanwhile, is smooth and earthy in taste. is known for having a stinging, ammonia-like scent with some hints of earthy pine. This sticky cannabis strain gives a strong cerebral high. In fact, if taken in high doses, it can be quite daunting. Despite that, the user remains functional and acutely aware. It has strong, stable genes due to which it is commonly used for crossbreeding for producing more hybrid strains. Although the White Widow is relatively lacking in the flavor department, but when it comes to fast cerebral effects, it performs exceptionally. After smoking, users become more perceptive aware of the surroundings and experience a burst of energy. This combined with improved mood and focus, helps unleash the user's creative and problem-solving side. As the effects of White Widow are mainly just mental, therefore its applications in medicine are also limited to psychology. It has helped those with ADHD by improving focus and has provided temporary relief to depression or fatigue by boosting energy. In some cases, White Widow even aids in combating migraines. To grow a White Widow plant, you can either use clones or seeds. Clones can be obtained by taking clippings from already cultivated plants of this strain. The plants usually don't grow taller than 6 feet and are bushy and wide. 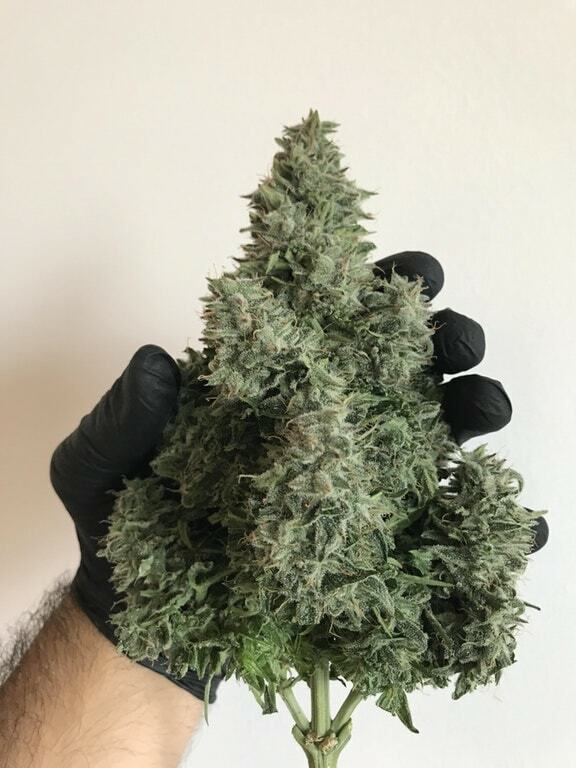 The good part about growing White Widow is that it is resistant to mold and gives an average yield of around 36 to 56 grams for each square footage of the plant. It requires a consistent temperature of about 70 to 80 degrees and flowers in around 9 weeks. The White Widow marijuana strain has a quick flowering time in comparison to other marijuana strains. You can expect it to flower within just 6 to 8 weeks. Commonly producing yields up to 1 to 3 oz per square foot, the White Widow marijuana strain is considered a to provide an average yield. When smoked or converted into an edible form, the flavor of the White Widow strain is best described as Earthy, Flowery, and Woody. Relaxed 92.34% of users reported feeling relaxed. Happiness 100% of users reported feeling happier. 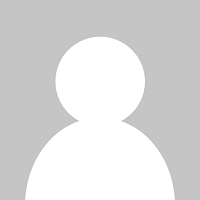 Uplifted 85.25% of users reported feeling uplifted. Creativity 65.01% reported improved feelings of creativity. Euphoria 81.36% of users reported feelings of happiness. Anti-Depressant 82.83% of users felt uplifted after consumption. Pain Reduction 66.54% of users noticed a reduction in pain. Insomnia 43.52% of users reported sleeping improvements. Stressed 100% of users reported reduced stress. Dry Mouth 100% of users reported a dry mouth. Dry Eyes 39.55% of users reported dry eyes. Insomnia 37.9% of users reported trouble sleeping. Dizziness 17.27% of users reported feeling dizziness. Anxiety 15.53% of users reported feeling anxious. 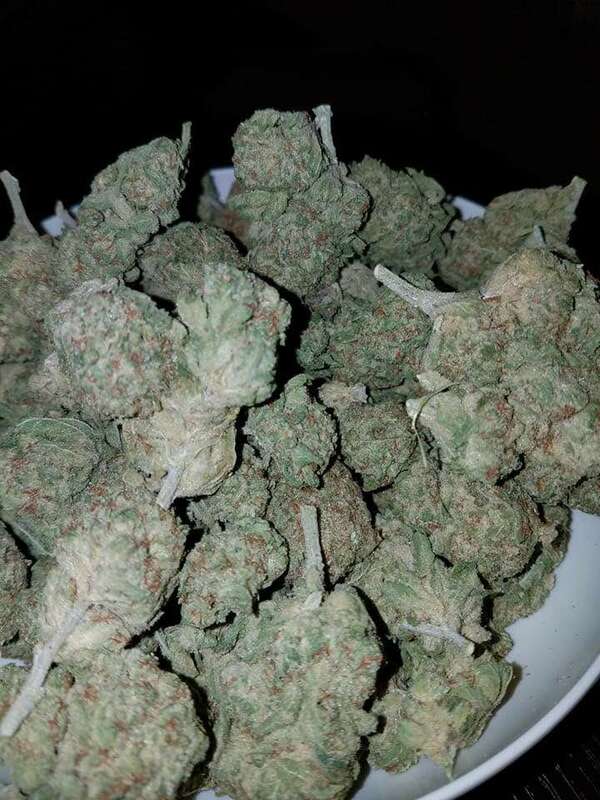 Below you can find a list of strains that are parents and predecessors which led to the medicinal effects and properties of the White Widow cannabis strain. It was through the breeding of these strains which led to the production of White Widow marijuana seeds, while attempting to cultivate their combined effects and therapeutic properties. South American refers to the indigenous varieties of marijuana (or landr..
Below you can find a list of strains which were bred from White Widow in an attempt to leverge it's medicinal properties and growing attributes. White Caramel Cookie by Sumo Seeds is a predominantly indica dessert stra..
Appleberry by Sumo Seeds in a predominantly indica harvest machine. Bred .. There are no questions about smoking White Widow marijuana. Ask one? There are no questions about smoking the White Widow strain. Ask one? WoW, it packs a punch and I can still manage to clean my house after. My last photo of my favorite strain :P Worth it for the busy smoker! Look at the way the lighting makes those crystals pop!! Look at the trichromes on this! wow. That's amazing. This nug is loaded with crystal, it's a brick of hash waiting to happen! Looks INSANE, smokes INSANE the best strain! !